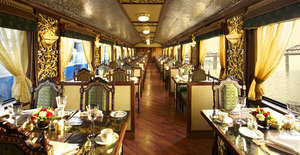 Travel through India via the award-winning luxury train, the Maharaja Express. The luxury train offers 5 different itineraries – Heritage of India, Indian Splendour, Indian Panorama, Treasures of India and Gems of India – that cover 12 destinations across North-West and Central India. Book your ticket for a 3 Nights/4 Days journey or a 7 Nights/8 Days days to visit the popular tourist spots like the Taj Mahal at Agra, Amer Fort in Jaipur and City Palace in Udaipur.